In large bowl, mix all ingredients except lettuce and chives. Place 1 lettuce leaf on each of 2 serving plates; spoon salad onto lettuce. Sprinkle with chives. About 2 cups dark meat from the legs and thighs will be remaining from the rotisserie chicken. Check out our recipes for Chile Chicken Enchiladas or Chicken and Vegetable Chowder on Pillsbury.com to use up the leftover chicken. 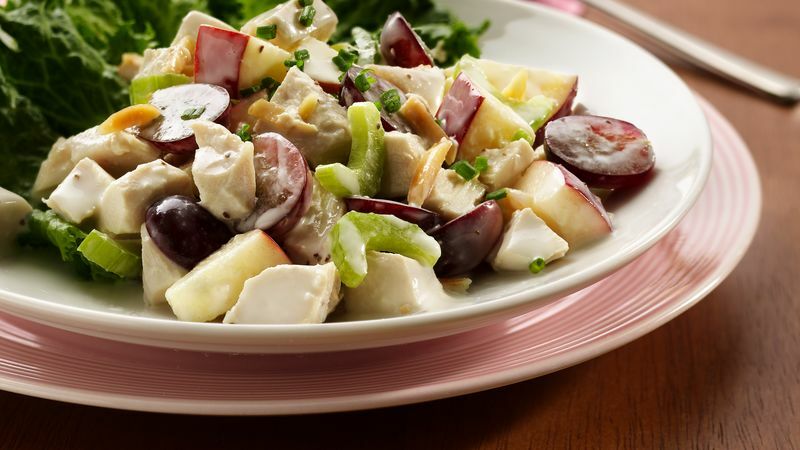 The newly created Waldorf Salad was the talk of socialites who dined at the Waldorf Hotel in the 1890s. This contemporary version will delight your guests just as the original pleased Waldorf Hotel patrons back in the day. *To toast nuts, sprinkle in ungreased heavy skillet. Cook over medium heat 5 to 7 minutes, stirring frequently until nuts begin to brown, then stirring constantly until nuts are light brown. To toast nuts in the oven, spread nuts in ungreased shallow pan. Bake at 350°F 6 to 10 minutes, stirring occasionally, until light brown.